Sotheby’s officials usually try to find something to crow about in their quarterly conference calls with analysts. But it’s hard to sound bullish in the face of a third-quarter net loss of $54.5 million, as compared to a $17.9-million loss for the same period a year ago. The third quarter, when relatively few auctions are scheduled, is traditionally weak for the auction houses. This year’s was super-weak, with a $211-million decline in net auction sales, compared to the same quarter last year. That was partly due to the shift of London’s summer Contemporary sales from the third quarter last year to the second quarter this year, accounting for $197 million of the decline. But looking at the results for the last nine months, rather than just the weak third quarter, doesn’t inspire much more confidence: For the nine months that ended Sept. 30, Sotheby’s reported net income (i.e., profits) of $8.6 million, an 84% decrease from $54.9 million the previous year. In its press release, Sotheby’s blames this on the “decrease of $764.5 million, or 26%, in net auction sales, associated with the recent decline in the global art market.” Because of the decline in net auction sales, auction commission revenue dropped $21.7 million (38%) in the last quarter and $89.9 million (20%) in the nine months ending Sept. 30. Yesterday’s was the fourth conference call in a row (also here, here and here) in which Sotheby’s CEO since March 2015, Tad Smith, brought in to boost lagging performance, had to strain to find some cause for optimism in the face of a slumping balance sheet and lagging auction revenues. The best he could say in yesterday’s press release was vague and conditional: “There were encouraging but tentative indicators that the market could be looking for a rallying point [meaning what? ]” (emphasis added). The “tentative indicators” include the 61% increase in first-time bidders, compared to a year ago, and a 23% increase in year-to-date online sales, compared to last year. A new board member, Linus Cheung, whose appointment is related to the emergence of Taikang Life Insurance Co. as Sotheby’s biggest shareholder, may provide insights into boosting business in China. 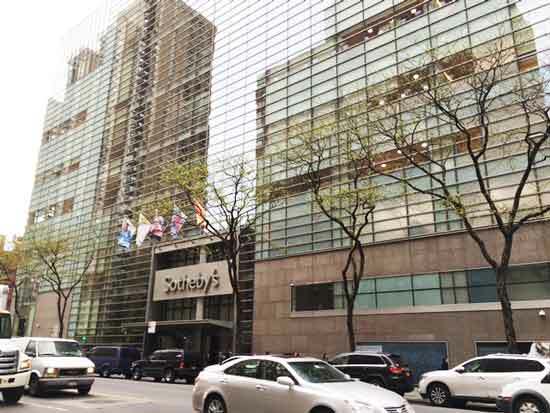 In connection with Cheung’s appointment, Taikang “has agreed it will not increase its ownership position beyond 15% for a period of three years, subject to certain conditions,” according to Sotheby’s announcement. In other words, the auctioneers all seem to agree that these are difficult times for their business. The unanswered question is, “Why?” Some say that the unnerving effects of the presidential election in the U.S. and Brexit in Great Britain have spooked potential consignors. But I suspect that there may also be growing buyer and seller resistance to the convoluted machinations of the auction houses in manipulating sales (which I’ve discussed here, here and here), making it hard to know what things are really worth. What I’d be curious to know (which, perhaps, some enterprising art-market reporter can investigate) is whether disenchantment with auction-house practices (not to mention their inexorable rise in fees that they charge to buyers) is shifting business to dealers. The new rate structure is 25% on the first $250,000 of hammer (sale) price; 20% on the portion of hammer (sale) price above $250,000 up to and including $3 million; and 12.5% on any remaining amount above $3 million. The hammer (sale) price thresholds in other currencies will be adjusted in a commensurate manner. The existing buyer’s premium rate structure, which has been in effect since February 1, 2015, is 25% on the first $200,000 of hammer (sale) price; 20% on the portion of hammer (sale) price above $200,000 up to and including $3 million; and 12% on the remaining amount above $3 million. Christie’s buyer’s premium, which went into effect Sept. 19, is: 25% on hammer prices of $150,000 or less; 20% from $150,001-3 million; 12% on the excess. As of November 4, 2016, Sotheby’s had outstanding auction guarantees totaling $258.8 million and, as of that date, Sotheby’s financial exposure was reduced by irrevocable bids totaling $144.2 million…. A substantial portion of the property related to these auction guarantees is being offered at auctions in the fourth quarter of 2016 [i.e., the evening Impressionist/Modern and Contemporary sales]. Three months ago, Smith had promised that there would be “more judicious use of guarantees.” I suppose, for now at least, nothing will reach the reckless level of the $515-million guarantee (not backed by irrevocable bids) for the Taubman Collection. Still, $258.8 million ain’t chicken feed, especially in an uncertain market. We will likely see a lower sales level in the fourth quarter, consistent with the trends we’ve seen during the past six and nine month periods, of down 22% and 26%, respectively.